Related Articles: Linckia Stars, Asterina Stars, An Introduction to the Echinoderms: The Sea Stars, Sea Urchins, Sea Cucumbers and More... By James W. Fatherree, M.Sc. During my sailing I've noticed that nothing is moving the sand in my aquarium, and it is getting dirty! Since dirty sand is no good and I personally care to not have Green Sand, I was hoping a starfish might help me with my problems. Sounds almost good? Maybe? . . . hopefully? But not any starfish will do, as I have anemones, and prefer for the future crew member to not eat an expensive snack. Do you have any suggestions? I've researched a few, and noticed the Orange Linckia and Blue Linckia are both Reef safe. That's good no? gallon, and my main worry is that it may be too small. Is this the case? The website lists it as needing a 25 gallon tank at least. Also I have no corals, a nice sized hermit, (fits in a moon snail shell, medium sized) a 3-4 inch sand bed, Engineer Goby and alas! a lot of rocks. Would I be able to house two Orange Linckias? They seem pretty cool. Any suggestions or help would be great! I'm open for any other cool starfish species you might pick from your brain :) I bet you guys have tons of cool nifty things in your arsenals. <Serpent star are generally hardy, but are fish eaters at times and won't help much with the sand bed, http://www.wetwebmedia.com/brittlestars.htm . Nassarius or Cerith snails may be more of what you are looking for. I also plan on getting a mandarin soon, any conflicts? I've done lots of "Googling" to see if anyone else has had this experience and from what I can find nobody has. 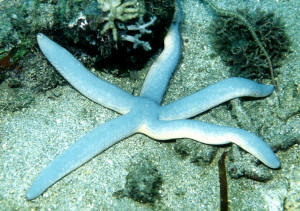 I realize that the diet of a Linckia starfish is unknown, and that they typically die of starvation in captivity. As I evolve into a more aware and responsible reef keeper, I now know that this was a purchase that never should have been made. I'm certain that my Linckia is eating two different types of Montipora. I have orange Monti. cap. and encrusting "superman" - blue with red polyps. Both of these corals are extremely healthy, grow rapidly, and have been fragged multiple times. In the past couple months, but never before, I have been catching my blue linckia on top of these corals. If I catch him soon enough, the corals are fine, but if he is allowed to remain on top of the coral all night, a significant part of the coral is completely bleached and all tissue is gone from that area. Could he actually be eating the coral? I thought these were "reef safe"
Is he starving and resorting to whatever he can get? He is about 1 year old now. Since apparently very little is known about this species I thought you would be interested to learn this. Also I thought maybe you would have a different perspective on the situation.